Born: December 5,1830 in London, United Kingdom. Died: December 29,1894 in London, United Kingdom. 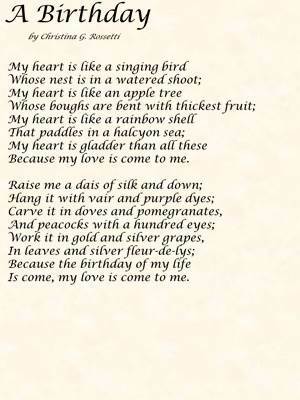 Rosetti is known for writing children's poems, romantic and devotional works. She was a lively child and dictated her first story to her mother before she could write. When she was 14 she had a nervous breakdown and quit going to school. She would then suffer with depression off and on through her life. Her first poems were published at age 18 and she was hailed to become Elizabeth Barrett Browning's successor. Her religion was important to her and can be found in her writing, as well as her passion to help women who came out of prostitution. She continued to writeand publish her whole life.